A substantial quantity of explosive material was found at Hackballscross following the arrest of two men. 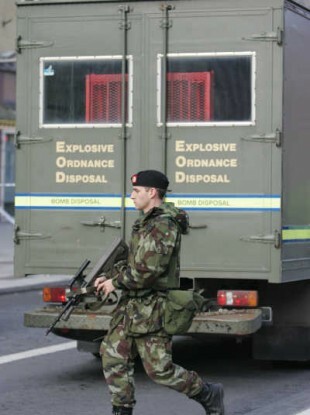 AN ARMY BOMB disposal team spent six-and-a-half hours making safe a substantial quantity of explosive material on a farm in Co. Louth yesterday. The team was called to the scene after two men were arrested on the farm near Hackballscross in the early hours of yesterday morning as part of a planned operation targeting dissident activities. A defence forces spokesperson has said that components of an improvised mortar sytem were found and made safe at the scene. The remains of the material found have been handed over to the Gardaí for further investigation. The scene was declared safe at 11.30pm last night. The two men, who are in their fifties, are still being questioned at Balbriggan and Drogheda Garda Stations. Email “Army bomb disposal team spends over six hours on Louth farm”. Feedback on “Army bomb disposal team spends over six hours on Louth farm”.